The first is the German SDkfz 231 8-rad Armoured Car, which is one of my favourite German vehicles of the war. The kit gives build options for the 231, 232, 233 and 263 variants. Unfortunately, these have come a year too late for my own collection, although I’ve mainly got the later 234 variants, so if I look at putting together a force for the Western Desert these will definitely be on the shopping list. The SDkfz box set will be released on the 17th February, and is currently available to pre-order from the Plastic Soldier Company website. Looking a bit further ahead to March, and PSC are finally releasing the 15mm version of their British Universal Carrier. It looks like PSC have really gone to town on this box set, with no less than eight different variants available to be built. I hope is that this kit will be easier to build than its 20mm predecessor, which I found to be an absolute pain in the arse to assemble. Part of the problem is that the vehicle is pretty small in 15mm, and yet it still comes in 7 or 8 parts – admittedly this is no where near as bad as the Zvezda SDkfz 222, but I still expect it to require a level of patience to assemble. 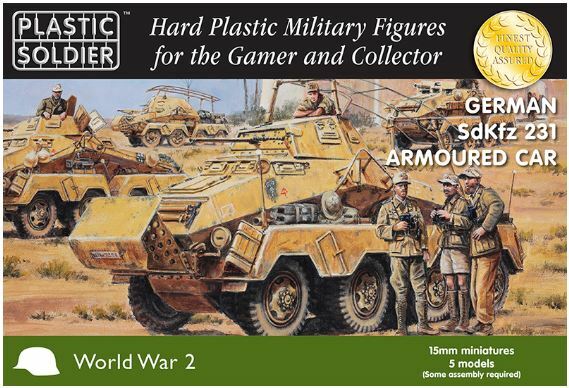 On the plus side, the sheer number of variants in the box make this a must-get for any player making a 15mm British force for World War II (I have already given Mr Luff due notice). The Universal Carrier box set is due to be released on the 24th March 2017. For me, one of the joys of playing a game like Chain of Command is that small vehicles such as the SDkfz 231, or the Universal Carrier (especially the Vickers or Wasp variants) have a large impact on the battlefield – something which many World War II rules seem to lose somewhere along the way, although to be fair, this is not always the fault of the rules as many players seem to fixated on larger vehicles. Armoured Cars and tracked carriers (not only the Bren Carrier, but also the M3 White halftrack or SDkfz 250 / SDkfz 251) may not be as glamorous as a Panther Tank or Sherman Firefly, but they impact the game in a way that highlights why these vehicles were produced in the first place. As gamers who play World War II, we all love getting tanks out on the table, but games with these lighter vehicles are just as rewarding.